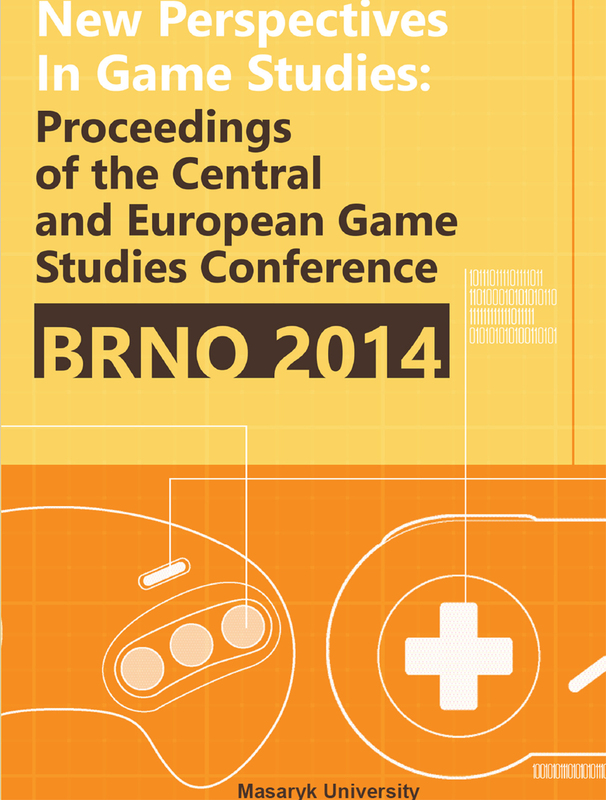 Proceedings of the Central and Eastern European Game Studies Conference 2014 : MU Game Studies, z.s. On October 10–11, 2014, around 150 people gathered at the Masaryk University in Brno, Czech Republic to discuss and learn about digital games. It was the first annual Central and Eastern European Game Studies (CEEGS) conference – and it marked an important step in the integration of digital games research across the region. It was the first time when game scholars from different parts of Central and Eastern Europe met to share their research, and the start of many fruitful collaborations, both within the region and with our Western European colleagues. “You Must Gather Your Party Before Venturing Forth”: Why Did Computer Games From Around 2000 Become So Important in Poland? The turn of the 21st century was a significant period for computer games in Poland, especially in the roleplaying and strategy genres. The titles published at that time include Fallout, Starcraft, Baldur’s Gate, Heroes of Might & Magic III, or Planescape: Torment. This paper seeks to explain why these and other similar games had an important impact on the identities of many Polish players and contributed to the national gaming culture. Several social and cultural factors are analyzed, such as the players’ sociodemographic characteristics, the historical development of cRPG (computer roleplaying games) and RTS (real-time strategy) games, the role of Polish publishers, and the significance of technologies. The methodology of the study draws from Wendy Griswold’s cultural diamond heuristic, which emphasizes the benefits of investigating cultural objects (in this case, games) in relation to their producers, players, and the general social context. In general theoretical terms, the paper is grounded in cultural sociology. The aim of this paper is to re-frame criticism of video-game portrayal of the human body and basic human interactions in light of Mikhail Bakhtin’s theory of carnivalesque and grotesque realism. According to the Russian scholar, the latter is a dominant aesthetic convention for the former, facilitating representation of the essence of carnival (understood as a worldview, not a festival). My claim is that various grotesque deformations of bodies in mainstream, high-budget video games, such as over-muscled male protagonists, hypersexual women and hideous or inhuman enemies, as well as the strange obsession with producing photorealistic settings, fall firmly into this aesthetic. The same is true for the fragmented, incomplete body of the first-person-perspective protagonist. The imaginary is further strengthened by the common way AAA videogames handle human interaction, as they are prone to reduce any contact to various collisions of bodies, eliminating any other social convention-even simple conversation—outside the realm of gameplay or else seriously reducing it. The most important collision of this kind is, of course, combat of an often excessively violent nature. Fighting conjures important aspects of the carnivalesque: ritual humiliation and the dismantling of hierarchies—represented by clear stratification of antagonists, varying by strength and danger they pose to the protagonist— by reducing them to their carnality. This mode of interpretation opens up further perspectives with regard to inquiry into the social importance of violent video games as possible vehicles for the expression of opposition to static ethical and political orders. This paper will show how the collage technique actively influences the structure of Amanita Designs’ games, such as Samorost series, Botanicula, Machinarium. These examples are particularly interesting as the artistic techniquein this case goes beyond the aesthetic aspects (visual art and music) and the narration, and actively informs the gameplay. The structure of these game cluster spaces is built not only from material artefacts of human culture but also from the elements of nature. Such refined structure of virtual assemblage seems to escape the concept of simulacrum. The creators base their technique on a deconstruction of one reality, and at the same time they build entirely new worlds. Every time they set a spatially complex structure in the two-dimensional environment of the game, it manages, despite its fantastic nature, to maintain its full integrity. The new reality, however radically anti-realistic, does not try to pretend to be something else than itself. Hence the worlds created by Amanita Design seem to be the answer to the dominant hyper-realistic aesthetics ofmainstream games. The article explores the way a particular glitch is defined in video game culture and argues that the process of definition is in fact a negotiation between different groups of stakeholders. After a glitch is identified, the proces of negotiation among the players, press and developers continues. The use of a glitch also has to be defined and interpreted. In this article, I take a closer look at glitches that interact with microtransactions in full-price video game titles, using examples from two games published by EA: Mass Effect 3 and Dead Space 3. While players of both games used glitches to bypass the microtransactions, fan and press reactions to these two cases of glitch exploitation were significantly different. While nearly no one questioned Mass Effect 3’s missile glitch to be a cheat of sorts, the infinite respawn glitch from Dead Space 3 was subject to many discussions regarding its nature as a glitch or a feature. This article analyzes the discourse of glitch discussions and offers explanations as to why the two cases have differed so radically. The implementation of games and game principles has been a specific approach in the context of urban planning and development for a long time. There has been an increasing number of games specifically designed for supporting decision-making and public participation in planning processes, as well as in the education of urban planners. Yet, there is a lack of analysis of urban games as it relates to their possible contribution to the field of urban planning. This paper provides a summary of the main developments of games in the urban context with an overview of recent examples, and explores interrelations of game genres and platforms, and potential fields of implementation. The paper deals with theoretical and practical aspects of Tetris in marketing communication within the realms of a current phenomenon called gamification. The historical review of Tetris is followed by a summary of definitions and criteria of gamification, as well as its implementations within the domain of advertising. Later, the process of gamification is analyzed for non-narrative games with the aim to determine a theoretical basis for research. Results of Osgood’s semantic differential – a part of online questionnaire – focused on the participants’ perception of various dimensions defined within commercials applying or not applying principles and mechanics of digital games. This research tool provided data for the final comparison with the aim to determine the effectiveness of using digital games and their elements for marketing purposes. This text is focused on the question of relations between players, video game enthusiasts as spectators, and fictional content introduced by the technology: software and hardware that support he ludic experience. The first topic of interest will be e-sports, or electronic sports: competitively played games, often involving dedicated gaming arenas and TV / internet live coverage. The second point of interest will be the players experiencing game content via streaming channels or internet TV (such as twitch.tv). In-depth analysis, based on participant observation, will cover a recent major event which took place in Katowice, Poland, namely the finals of the Intel Extreme Masters (IEM) World Championship of March 2014. The text focuses on a selected group of computer games, which have potential to connect both active players and spectators of the particular game in ludic experience (e.g., StarCraft, League of Legends, Counter-Strike: Global Offensive). The thesis of the paper states that by recognizing the features of selected modern computer games, which create a unique environment where on-screen actions are conducted through various technological means, TV-mediated ludic pleasure is ‘transferred’ from professional players (who, at a certain level, do it for the sake of money, not just for ‘fun’) to e-sports enthusiasts, the vast majority of whom also consider themselves as active gamers. Each game, apart from having a ‘storyline’ created in real life by the players, is culturally encoded by secondary and tertiary narratives stimulated by the viewers, commentators and in-game observers. Nowadays, similar situations occur outside the e-sports genre, involving players who are immersed in participatory, fandom-based practices and who experience numerous games before their actual release. Therefore, my main questions of interest on the topic of e-sports relate to how and why they became so popular in Poland, and what impact they have on the ways that both gamers and non-gamers perceive modern video games. The community aspect of e-sports is also considered, with a focus on cultural (and national) diversity among e-sports enthusiasts.